Silicone Teething Necklaces are a great alternative to wearing a necklace during those early years of being a mom. 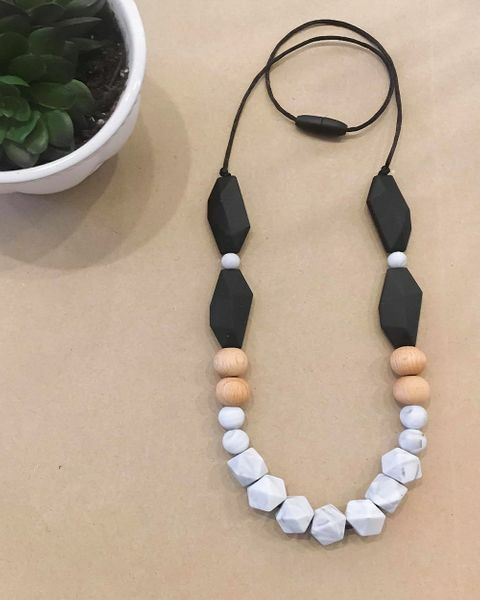 Each necklace is lovingly handmade and features food-grade silicone and/or wood beads that are sealed with organic coconut oil. The silicone is bpa, lead, and phthalate free. It also has no odor. These necklaces can be utilized during nursing for baby to play with and/or during the day for baby to chew on when the teething stage hits. Each necklace is features a pop clasp that can be popped open but is not necessary to do so to put on. They easily slip around mama's neck. These are meant for moms to wear, NOT THE CHILD. Each necklace drops approximately 15" for a total length of 30". All handmade here in the USA. Each piece is non-refundable or exchangeable due to the nature of what these teething rattles are designed for.